Atlanta, GA: “When I walked on stage, it’s safe to say I thought my knees might buckle at any point. There were around 150,000 people there and it was also televised Live on TV Asia (estimating to reach around 300,000)…. 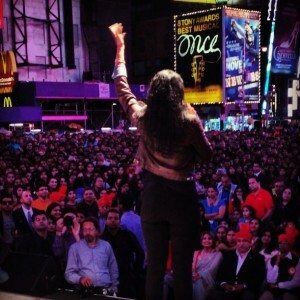 so it was my biggest performance ever,” exclaims singer/songwriter Shilpa Narayan. Born and raised in Georgia, Narayan had the opportunity to shine at a landmark Diwali event in New York this September. 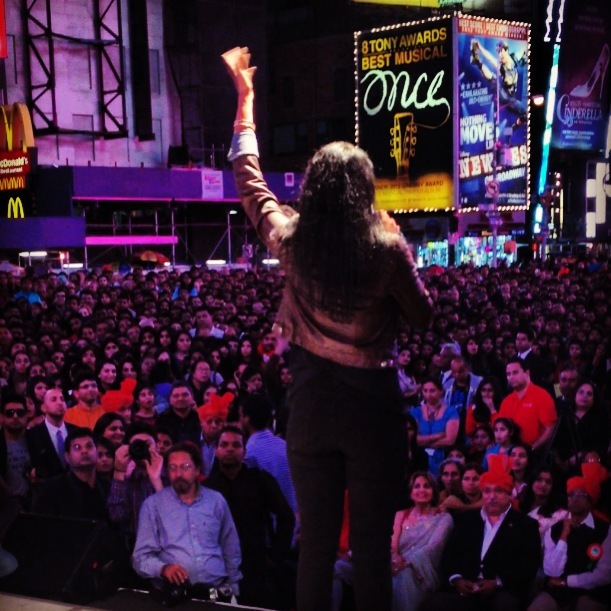 Times Square, New York exuded a complete desi vibe this September 22, 2013, with a day full of Diwali festivities. The event bustled with various programs showcasing everything traditionally Indian includes clothes, Musical and Dance performances, Diya and Rangoli Painting, Saree draping lessons, Henna and Indian cuisine. Star performers at the event included Bollywood heartthrob Ranbir Kapoor, his parents, Rishi and Neetu Kapoor, Pallavi Sharda, singer Shankar Mahadevan and Culture Shock. Shilpa Narayan, now settled in New York is a singer/songwriter originally from Alpharetta, GA and went to school at Georgia Tech a couple years ago. 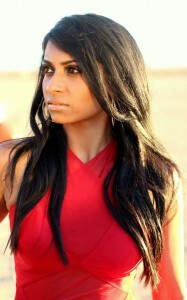 She has been pursuing singing for about four years. “Over the past year, I’ve been really lucky to work with a rapper named Kaly. He was asked by the organizers of the Diwali Times Square show to perform and since we’d done some songs together, I was asked as well,” Narayan says of the opportunity. With thousands gathered at the popular tourist destination to celebrate Diwali, it was Narayan’s huge chance to enthrall and entertain the crowd. “I didn’t actually realize how many people were going to be there and how large of a performance this would be. When I walked on stage, it’s safe to say I thought my knees might buckle at any point. There were around 150,000 people there and it was also televised Live on TV Asia (estimating to reach around 300,000)….so it was my biggest performance ever. The crowd was waiting for Ranbir Kapoor to come out and we performed right before he came on stage, which was both good and bad. Good, in that we had an amazing audience to perform to but bad, because I think a lot of people were wanting him to come out! We were able to perform three songs, 1 being my single Renegade, and I think the crowd warmed up to us. We wanted to showcase something a little different, with more of an urban R&B feel and although that isn’t the traditional music for a Diwali Show, we were very honored to be able to show our flavor of sound. All in all, I had the time of my life and was so happy to be a part of such a historic event” she says about her experience at the show. Narayan released an album called “Stand Alone” last year which can be found on itunes, and is working on a brand new album. “The1st single off that one is a song called “Renegade” which to me is about pursuing your dreams, whether they’re the popular/traditional choice or not,” says Narayan. You may check www.ShilpaNarayan.com for more details. Here’s wishing Shilpa Narayan the very best in all her endeavors.